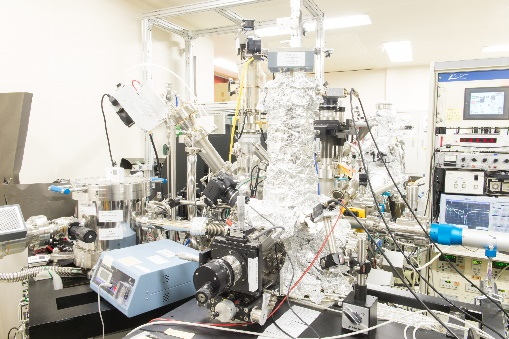 The mission of the AIST nanocharactarization Facility (ANCF) is to solve problems that commercial analytical instruments cannot deal with. 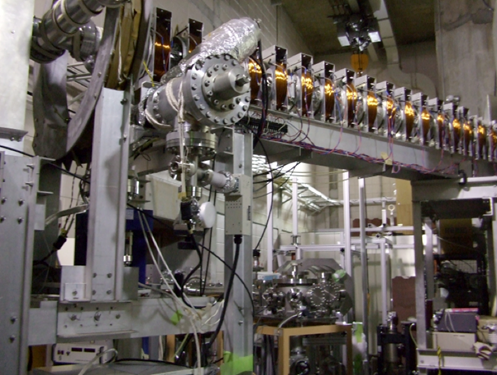 For example, commercial TEMs often face difficulties in visualizing atomic vacancies or a small amount of light-element atoms in light-element matrices. 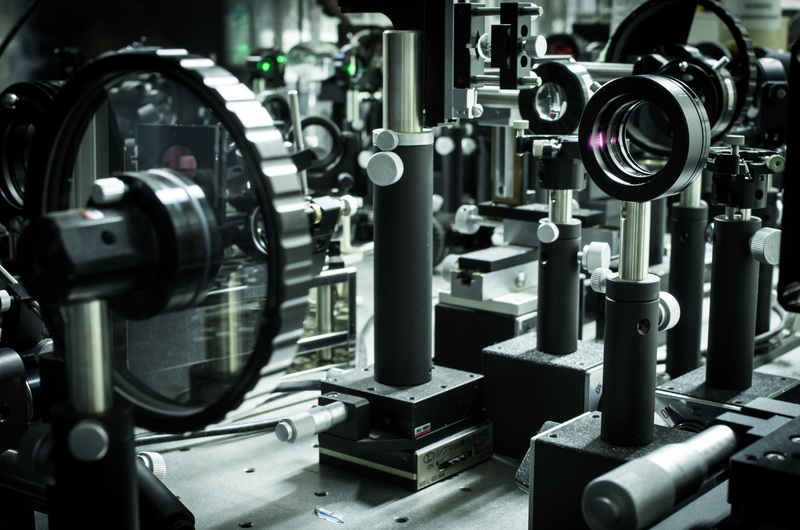 Our non-commercial analytical instruments cannot distinguish a single atomic vacancy or a single light-element atom, but they can measure the vacancy concentration and the lattice locations of light-element atoms in a region of 10 μm to 10 mm diameter, on average. The operating characteristics of nano-devices are usually related to the averaged macroscale nanostructure rather than a single atom. This is analogous to the contrast between the harmony of the forest averaged over individual trees and the location of a single tree within the forest. 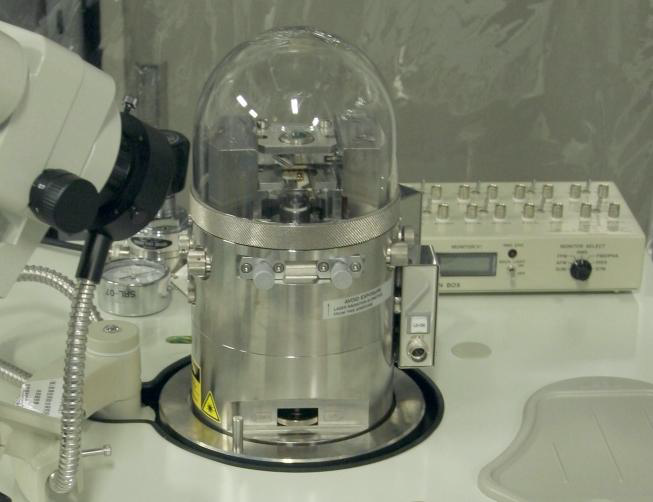 We provide analytical instruments and methods for observing the nanoscale harmony. The "Nanotechnology Platform Japan (NTPJ)" is the project by the Minister of Education, Culture, Sports, Science and Technology (MEXT). The mission is to establish a reliable research infrastructure (Platform) for scientific innovation by the alliance of the institutes which have cutting edge equipment and research know-how. Through this program, it is promoted for any of researchers from young to industrial one to do the share-use of the equipment, and to provide the shortest way to solve the urgent problems in science and technology. Therefore, all of scientists are invited to participate in this project to share equipment beyond the barrier of scientific communities and research organizations. 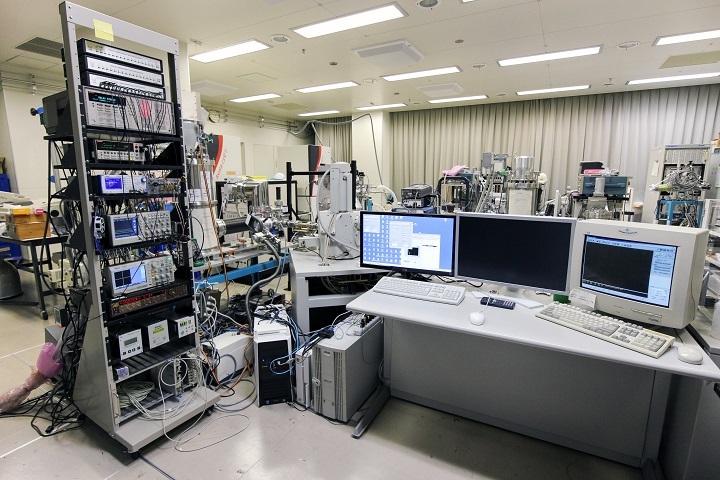 In this program, 38 groups from 26 institutes and universities are joined and establish one single structure for "Share-Use Cutting-Edge Facility for Nanotechnology", which will be supported by MEXT for 10 years from 2012. NTPJ consists of three platforms. The "Advanced Characterization Nanotechnology Platform (ACNP)" is composed of 11 institutes and representative organization. 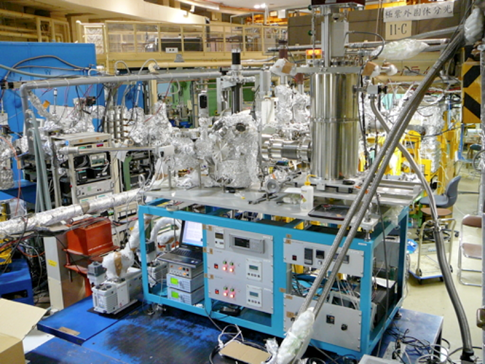 We construct a network of advanced characterization shared-facilities to contribute to the innovation by solving the problems of academia and industry in the fields of nanotechnology and material science, to enhance and strengthen the Japanese nanotechnology research basis, and to support human resource development in a nanotechnology field. Further, by sharing advanced characterization facilities and making achievements top-level in the world, we promote the collaboration among industries, universities and the government. ANCF is a member of ACNP. 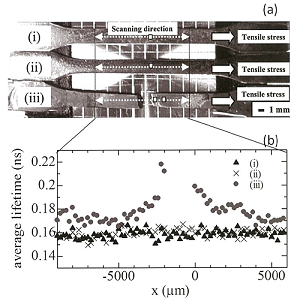 Studies on the relationship between hydrogen embrittlement of high strength steel and lattice defects associated with hydrogen. Three kinds of high strength steel samples were prepared (see Fig.(a)). Specimen (i) was neither stressed nor the hydrogen charging process applied. Specimen (ii) was stressed for 75 h without hydrogen charging. Specimen (iii) was stressed for 75 h until fracture with hydrogen charging. 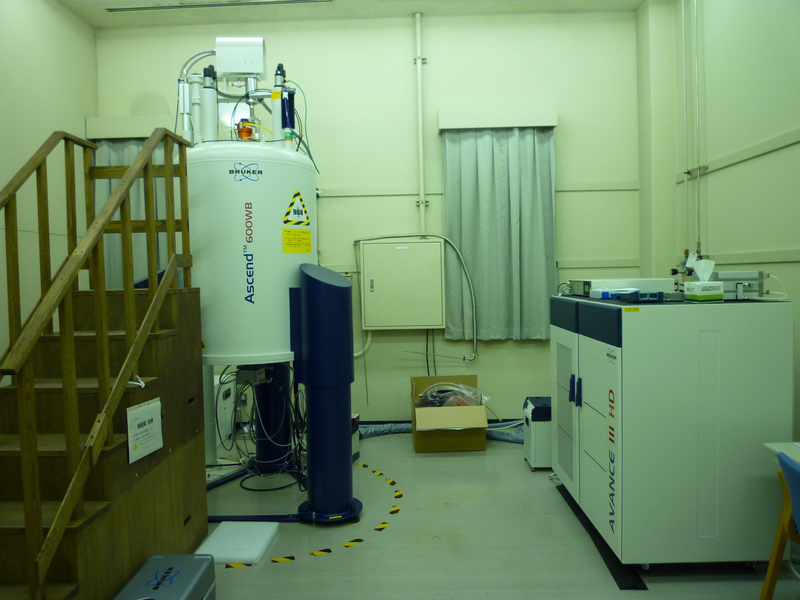 We have measured average positron lifetimes of these specimens by scanning a positron microbeam along the sample direction X. Results are shown in Fig.(b). For specimen (i) and (ii), the average lifetime had almost the same value. On the contrary, for specimen (iii), the average lifetime increased in almost all areas. These results indicate that vacancies or vacancy clusters were additionally formed in specimen (iii). Removing nano-contaminants from the Si substrate are quite important for future semiconductor devices, since the design rule of Si devices becomes smaller and smaller. 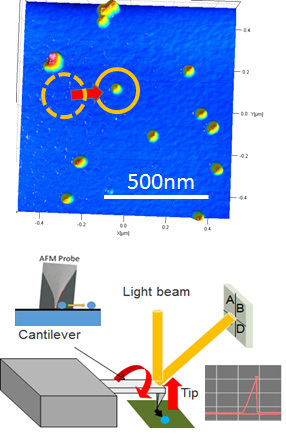 Removal force of nano-particles were measured to develop cleaning equipment for Si wafers. If the adhesion forces of nano-particles to the substrate are smaller than that to collapse the nanoscale pattern, it will be possible to establish cleaning process of Si-wafers. We succeeded to prove that removal force of silica nano-particles, which are one of the major contaminants of Si processes, can be cleaned from Si substrate without collapsing nanoscale patterns. ancf-contact-ml[at]aist.go.jp　*Please change "[at]" to "@"